The nature of work in changing at a swift and rapid pace and with new mind-sets must emerge – hierarchies are being upended, the battle for top talent is intensifying and great leaders know that a strong and effective culture is critical for competitive advantage. 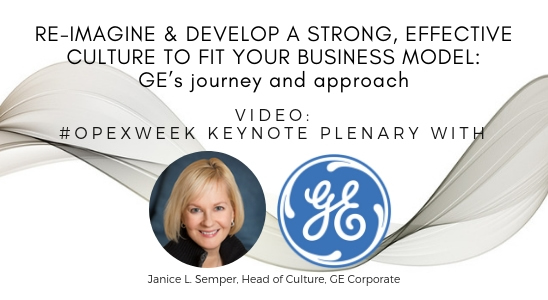 In this exclusive and complimentary video of GE’s plenary keynote at OPEX Week: Business Transformation World Summit 2018, GE unveils the company’s most significant transformation in history. Vital to the company’s success as a digital industrial leader is enabling its 300,000 employees to think, act and lead in new ways. During this keynote, Janice Semper, Head of Culture for GE Corporate, shares invaluable insight into GE’s new approach to Performance Development, the complete re-imagining of the role and responsibilities of managers and the crucial steps to creating a more open and dynamic environment, providing employees with more empowerment, and increasing the overall customer impact.